That should be every FOUR years of course, but can’t change it anymore… Damn. Watch! Gymnastics. Yes. Especially if you go for the shoulders. Those little suits are really tight and show enough muscles to charm you. Those who dangle at the rings have really impressive shoulders. If you think that is too much, watch the other guys, less muscles but still… Still… Ahh. Disappointing. Those swimmers are so well-built, but how disappointing to watch them swim! They enter is oversized jackets, goggles and what I call a bath hat. They jump in the water. They swim. You see nothing but their waving arms and their bath hats going up and down and maybe a piece of their back or belly. Only when they get out of the water, the fun starts… Their bodies are AWESOME. Very nice. As we say, a ‘caress for the eye’. But you have to wait until the competition’s over. Timing is everything. Don’t watch! Equestrian wipes out every difference between men and women. Watch this only if you like horses or androgyny. Man? Woman? Who will tell? Watch! The obligatory uniform for beach volley is the bikini, plus, they are athletes so they are very streamlined. Nice. Disappointing. Yes, gymnastic’s area is filled with young girls, but some of them look like children, and their robot moves are not very charming. I mean, they do incredible things, but they lack emotions. 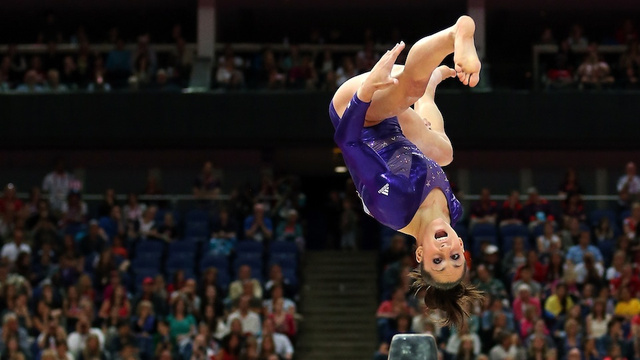 A smile on a gymnast’s face is rather unique. Combined with those curt, sharp moves, this is rather disappointing. And those hands… Always so… cramped. Don’t watch! Swimming women wear bath suits that cover up everything feminine, their shoulders are really muscular… I can imagine that men are most likely to be scared of women who are obviously stronger than they are. So I would not recommend watching these competitions.